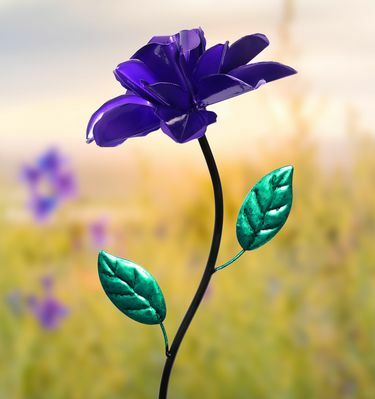 A single Purple Kinetic Rose Stake spins in the breeze, adding vibrant color, motion and life to your garden! Beautifully hand painted in metallic purple, this stake makes a wonderful addition to your home and a great gift for the garden enthusiast. Made of durable metal that is UV treated to resist fading, also available in multiple colors for a colorful bouquet of fun! Size: 8" x 8" x 39" H.